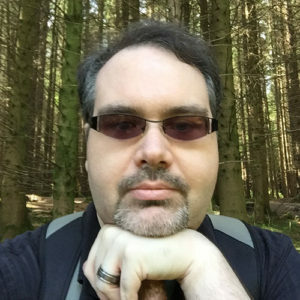 John P. Bell is a software developer and artist at Dartmouth College, where he is the Associate Director of the Media Ecology Project and Lead Application Developer in ITS with a focus on digital arts and humanities projects. His research focuses on collaborative creativity and has produced everything from utilitarian semantic web publishing platforms to aggressively useless installation art. With nine others, he was the co-author an 85,000-word long book about a 38-character long computer program. In addition to his work at Dartmouth, he is also an Assistant Professor of Digital Curation at the University of Maine and Senior Researcher at the Still Water Lab. He holds one of what is believed to be the first three collaborative doctoral degrees ever conferred in the United States, the other two of which are held by the co-authors of their collective dissertation on collaboration in the arts.